This video of racist diatribes from a white Catholic priest is too tragic and too sad to comment upon. He is speaking as a special guest of Trinity Church in Chicago, the church of Senator Barack Obama. It is almost as though Pastor Michael Pfleger was a Hillary Clinton plant. It is heartbreaking to see and hear these rantings in today’s America. “We Thank God for Father Mike” ~~Trinity Church Pastor. Yes the Trinity congregants loved him, and that is a large part of this heartbreaking tragedy. How else is there to explain the latest revelations about the Kennedy Family Seat that has been occupied for all these many years in the House of Lords & Ladies? Beginning in 1953, John F. Kennedy (Happy Birthday John), and then his brother Edward Kennedy, have occupied the U.S. Senate’s Seat. News comes that it is to continue in possession of the Kennedy family even after Senator Ted Kennedy’s departure from Washington because of illness. Apparently there was serious discussion as to which Camelot Kennedy was in line of succession to inherit the Kennedy endowed seat. For a while it seemed that the eldest son of Robert F. Kennedy, young Joe Kennedy, was the next scion to the throne. However, the Kennedys were reminded that back in ’76, long before their own arrival on the shores of Cape Cod, those quaint Massachusetts Minute Men shed a bit of blood over the British system of primogeniture. So as not to upset any descendants of Minute Men who may still be lurking about those parts, they decided to take a different tack for anointing the next Kennedy oligarch for the Kennedy seat in the House of Lords & Ladies. Besides, there was trepidation amongst some of the clan that young Joe Kennedy and his best bud and business associate, Strongman Hugo Chavez, may bring more grief and embarrassment to Massachusetts’ beloved First Family. It is Senator Ted Kennedy himself, the family’s patriarch and old lion of the House of Lords & Ladies, who chose his own replacement. He made it clear to everyone that he expects his Senate seat to stay in the family. The Kennedys have a Divine Right, in perpetuity, to that elective office, and the voters of Massachusetts are well aware of that fact. The new Kennedy clan member destined to carry the Kennedy family flame is young, smart, female and the wife of the present Senator Kennedy. She is 54-year-old Victoria Reggie Kennedy. Now you may have thought that we Americans fought a war a while back to overthrow a system of hereditary government. It is true that we did, and that the good people of Massachusetts were in the forefront of that Revolution. But that was then and this is now, and there has been a lot of water under that Concord and Lexington Bridge since then, and a lot of Kennedys over it. Those Massachusetts Minute Men were “citizen soldiers” and their government leaders, in those days, were “citizen politicos.” Today, in our “government by the anointed few,” we have only professional political leaders who serve until death do they depart. Senator Ted Kennedy came to occupy his brother’s seat in 1962, 46 YEARS AGO! After 46 YEARS in an official position, the law of Adverse Possession (aka as Squatters’ Rights) becomes effective, and the politico can legally bequeath his United States Senate or Congress seat to family members of his choosing or even to his young girlfriend, or boyfriend … or whoever the case may be. “We the People” have tried to get legislation for “term limits” passed, but whenever we elect a politician who promises to do that, he or she changes position when it comes times to leave, and as everyone knows, it is impossible to vote an incumbent out of office. Actually, this “Hereditary Oligarchy” might be a good thing. “We the People” wouldn’t have to bother voting anymore and all that wasted time and effort could be better spent. That was the message from Canada at the start of the Iraq War as Canada welcomed with open arms deserters from the United States military forces. Because Canada euphemistically labeled them as “War Resisters” a number of misguided U.S. soldiers took the bait. One of those DESERTERS turned “War Resister” was National Guard Sergeant Corey Glass. So how fares War Resister Sergeant Glass in his newly adopted homeland? Well … Canada’s Immigration and Refugee Board has just denied Glass’s application for refugee status and the Canadian Border Services Agency has issued him a June 12 deportation order to a country, the U.S. of A., where he is considered, not a “war resister,” but a genuine honest-to-god wartime deserter. Sergeant Glass, of Fairmont, Indiana, says he attempted to walk away from the U.S. Army but was told that would be desertion, which was punishable by death. Therefore, he welcomed Canada’s most gracious invitation, as anyplace would be better than facing a firing squad. But now the Sergeant DESERTER is on his way back to the land, people and messmates that he deserted a few short years ago. Now how fair is that Canada? To create a national folk hero out of an invited refugee because he spit in the eye of the United States military, and then to turn around and send that “invited refugee hero” back to his native land to face those same military mad dogs and wild wolves seems a bit inhumane, don’t you think, Canada? Sergeant Glass should take his case to the United Nations, as this is surely an international violation of human rights by Canada. 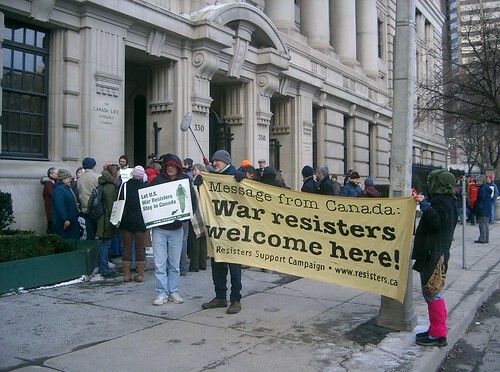 If you are an American deserter or “war resister” BEWARE of Canada’s Open Arms. You cannot be guaranteed that you will receive that glorious welcome that awaited the Vietnam War deserters and draft dodgers of another era. Of the more than 58,000 names inscribed on the Vietnam Veterans Memorial in Washington D.C., 103 of them are of “known” Canadians who served with United States forces. Although America has honored those fallen Canadians who did not return from the Vietnam war, their own native country never officially did so. The approximately 40,000 Canadian youths who volunteered to fight for freedom for others and against tyranny during the Vietnam era have never been acknowledged by Canada. Those who gave their lives in service to others have no official war memorial from Canada. Because of this, a small group of Americans in Michigan designed, built, and donated the Canadian Vietnam Veterans Memorial on Canadian soil, in Windsor, Ontario. It was a long, hard fought struggle that began in 1986, after Vietnam veterans Ric Gidner and Ed Johnson first discovered the untold story of the Canadian Vietnam veterans. They joined with American veteran Chris Reynolds and eventually covenanted with themselves and the unsung Canadian Vietnam veterans: “As Long As We Live, You Will Live. As Long As We Live, You Will Be Remembered. As Long As We Live, You Will Be Loved“. The three American veterans persevered and began planning fruition of the memorial, paying all expenses by mortgaging their homes, cashing their retirement funds and maxing out their credit cards. However, they never overcame the resistance of the government of Canada and were never permitted to build the Canadian veterans’ memorial under auspices of the Canadian government. It was the town of Windsor in Ontario that welcomed the memory of the fallen Canadian Vietnam soldiers, giving the memorial a home place on Canadian soil in 1994. Recently, I was saddened to read of more disquieting news relating to the memorial and the Canadian Vietnam veterans. An Internet essay entitled “With Equal Pride of Place,” tells of irreconcilable breaches between two Canadian Vietnam veterans organizations. It is quite sad that the bitterness and resentments that Canadians harbored against their fellow countrymen who helped the U.S. fight Communism so long ago, seems to have now infected the Vietnam veterans groups themselves. From what I am able to understand from the aforementioned writings, “The North Wall, Canadian Vietnam Veterans Memorial” has vehemently denied any association or affiliation with “The Canadian Vietnam Veterans Memorial Association, Windsor, ON,” accusing the latter group of not abiding by the original mandate of the Canadian Vietnam Veterans Memorial. According to the “With Equal Pride of Place” essay, many Canadian Vietnam veterans are complaining that the Canadian Vietnam Veterans Memorial, created with such great sacrifice by the three Americans, “ … has turned into something that is much less honourable:” an “ego trip” for many of the Vietnam Veterans and their associates in Windsor, Ontario. 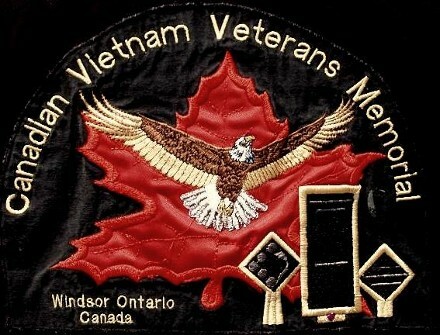 The Canadian Vietnam Veterans Memorial Association of Windsor, which apparently has sole responsibly for The North Wall, has been accused of “a misrepresentation of lineage, Orders of Battle, and the service of all,” including “Canadian Peacekeepers who fell In Harm’s Way during the years 1962-1973,” … whatever all that means. It surely means sadness for all of the aging Vietnam Veterans who live in Canada. I hope that this ugliness is not true, but knowing how difficult it has been for Canada and Canadians to face their Vietnam legacy, I suspect that it is. How fortunate that so many of Canada’s veterans of the Vietnam War never returned to their native land, choosing to live out their lives in the United States, where exists for all of us – The Wall, – lovingly and respectfully maintained by the government of the United States of America. If Bill Clinton was the “First Black President,” what will Barack Obama be when he is elected? During good Senator McGovern’s 1972 Democratic presidential campaign a young Hillary Clinton worked her heart out as a political organizer in South Texas for him. He described Bill and Hillary Clinton as “my treasured friends all these years,” and the former Senator became an ardent supporter of her presidential bid. However, when the going got tough for Hillary, and she lost the state of North Carolina, Senator McGovern flip-flopped for his “treasured friend.” He is now a big supporter of Obama. As McGovern spoke to a crowd of 7,000, and with his words placed Obama upon the same pedestal that Abraham Lincoln has occupied all of these last many scores of years, Republicans were chortling in their sleeves. While George McGovern was describing Barack Obama as “a second Abraham Lincoln,” Republicans were seeing Obama as a second George McGovern, an antiwar liberal about to be blown away in a wartime general election by a strong national defense candidate. Years ago it was Richard Nixon, the hawk, who defeated peacenik George McGovern with electoral college totals of 520 to 17, in the second biggest landslide in American history. Like the Democrats’ Al Gore after him, George McGovern did not even win his home state. She Can Dish It Out, But She Can’t Take It! Senator Barack Obama called Republican tactics of criticising his wife’s political comments as “low class” and “detestable.” On “Good Morning America” the senator and his wife Michelle were discussing his (their) race for the White House, when the Illinois senator told the television audience that the hardball political tactics that are acceptable when aimed for the gander, are unacceptable when targeted at the goose. “… I also think these folks should lay off my wife,” he told “Good Morning America,” as his wife Michelle chuckled. When Michelle Obama makes campaign speeches about being proud of her country for the first time in her adult life, no one on the other side of the political spectrum may criticise those remarks lest the Obamas label them as “low class” and “detestable.” No one may point out that while Obama was NOT listening to Reverend Jeremiah Wright’s preachings from the pulpit, his wife Michelle was. How else to explain that her attitude is so similar to that of their Pastor and spiritual mentor? Obviously Michelle WAS listening when the Reverend Wright preached racism and hatred against White America. Why Can’t the English Be More Like the Portuguese? Prime Minister Gordon Brown supported the reform as did Labour, the Lib Dems and the Conservatives. Britain’s parliament has voted to introduce contentious changes to their English language in order to spell hundreds of words the American way; thereby bringing their antiquated language into the modern era. The agreement standardizes (not standardises) numerous spellings and adds three new letters – o, z and er – to the alphabet. A large majority of Britain’s lawmakers backed government proposals to phase in the changes during the next six years. But a petition against the move was signed by 33,000 Britons and 100,000 Canadians who argue it is a capitulation to America’s already too powerful influence upon the English-speaking world. Proponents counter the move will make the English language more uniform globally, making such things as internet searches and legal documents easier to understand. Friday’s vote came after a unified form of the old English language was originally agreed with seven old English-speaking countries in 1991. The official language of more than 300 million people worldwide, American is spoken in the United States of America, including all of its territories. In addition, American is not only the language of global business, it is the language of world-wide art, science, and literature. American is the second language for virtually all inhabitants of the globe who have a second language, including some Britons. Even the French, when forced to speak a second tongue, always choose American over English. Prime Minister Gordon Brown and the British Parliament are expected to ratify the accord, with the blessing of the Queen, who has agreed, with the stipulation that “The Queen’s English” henceforth be awarded the status of a National Treasure. You are currently browsing the Kerfuffles and Flourishes blog archives for May, 2008.